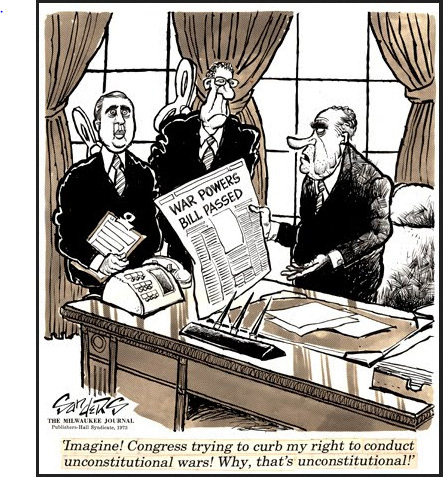 A political cartoon from the Bill Sanders Cartoon Collection is currently part of an exhibit titled “Congress and the Separation of Powers” in the U.S. Capitol Visitors Center, Washington, D.C. The exhibit examines Congress’s unique role and the ways in which it can balance or dynamically shape and challenge the powers of the other two branches. The show will run from September 1, 2018 to March 31, 2019. The Bill Sanders Cartoon Collection is housed in Library Special Collections at Western Kentucky University. Born in Springfield, Tennessee, Bill “Whitey” Sanders attended Western Kentucky State College and graduated with a Bachelors degree in English. He was a quarterback on the Hilltopper football team. While at Western, he was also a member of the ROTC and spent leisure moments sketching. He joined the U.S. Army after graduation to satisfy his ROTC commitments. While in the Army, Sanders decided to become a professional cartoonist. After brief stints with the Pacific Stars and Stripes, the Greensboro Daily News, and the Kansas City Star, he spent twenty-four years at the Milwaukee Journal, where he typically drew six cartoons a week. An award winning cartoonist, his drawings were syndicated nationally and are found in the collections of museums and libraries across the country. Sanders has always maintained close ties to his alma mater. In addition to donating hundreds of his cartoons to Library Special Collections, Sanders has returned to campus to talk with journalism students about the art of cartooning the role of journalists in American Society. In 1997, he was inducted into WKU’s Hall of Distinguished Alumni. An exhibit of Sanders’ cartoons is currently on display in the Jackson Gallery on the second floor of the Kentucky Building. Titled “That 70’s Show: The Editorial Cartoons of Bill ‘Whitey” Sanders,’ the exhibit features nearly thirty Sanders cartoons from WKU’s Department of Library Special Collections. Since his first donation of drawings to Special Collections in the early-1970s, Sanders has given well over 1,000 cartoons that stretch from the 1960s to around 2012. He continues to draw, and he still donates cartoons to the collection. A brand new book featuring Sanders’ cartoons Against the Grain: Bombthrowing in the Fine Art of American Political Cartooning joins several other books that showcase Sanders’ deft cartooning.